Heaven is for Real is the near death story of a young boy named Colton who visited heaven, while fighting an illness that brought his father and mother to their knees in prayer. During his recovery, Colton shared what he saw in heaven, which changed his family, community and world forever. The film was directed by Randall Wallace (Braveheart, The Man in the Iron Mask) and is based on the best selling book by the same name, which was written by Colton’s dad, Todd Burpo. 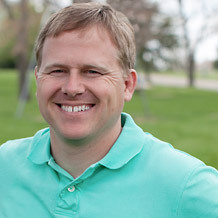 Todd is a down to earth pastor of Crossroads Wesleyan Church in Imperial, Nebraska. He is also a firefighter for the volunteer fire department and a chaplain for the Nebraska State Volunteer Firefighter’s Association. CJ: During the pre-screenings, was the film enjoyed more by conservatives or liberals? Todd: When many comment about Heaven is Real the movie they don’t identify themselves as one or the other. They’re either a fan or a hater. But I will say this, on Heaven is Real the movie, I’ve seen God assemble incredibly talented people and some strong Christians for this project. CJ: Your book is about your son Colton’s life experience. Were you concerned about the filmmakers getting the story right? Todd: Three years ago when I agreed to do this (film), I didn’t want to do it because I was scared, you know, how are we going to make sure we tell this story accurately? I had a lot of serious questions and God said, “Well, you’re gonna have to trust me. But I’m going to show you that I’m bigger than Hollywood.” And three years later, what you’re going to see come to that screen…God has answered that prayer. He has brought Christians like Devon Franklin, T.D. Jakes and Randall Wallace to this project…But one of the things they’ve all done is commit to telling the story Colton’s way. CJ: I like how the team was committed to “tell the story Colton’s way.” Did this come about organically? Todd: At the very beginning, if I was going to agree to this process, that would be the agreement the producers and Sony had to make. This is Colton’s story that they couldn’t change. There were boundaries they had to agree on and they were willing to accept those. And throughout that, I think the person in the creative process who triumphed that more than anyone else was Randall Wallace. CJ: Can you give me an example of how that unfolded? Todd: I would hear actors and actresses talk at the end of the day about how Randy Wallace would bring the cast together and say, hey this is what we’re doing today. This was not only meaningful and creative, but a spiritual journey for Randall Wallace and he kept that on the set throughout the whole making of this film. CJ: Wallace is known for films like Braveheart and my favorite, The Man in the Iron Mask. Those films have a lot of heart and it sounds like he drove this picture in the same way. Todd: People think I’m joking when I say this, but I’m serious. I tell people you’ll find that I’m the simple one and he’s the brilliant one. He’s incredibly brilliant. But the thing about Randall that he says about faith and that he brought to this movie, and he did it wonderfully, he says faith is not just a decision of the intellect, but it’s a decision of your heart – your whole soul. The emotions and everything, which I wanted to make sure was a part of this movie. CJ: How do you think the film will do with all the adventure films being readied for release? Todd: This is not going to be a big sci-fi type movie, but it’s a reality movie. And the reactions from the audiences that I’ve seen has surpassed what I’ve seen from big action movies…I’ve seen people cry and later stand up and cheer in this film. It’s amazing. I think the only other film I’ve seen the audience react so emotionally and get tied into was The Passion of the Christ. CJ: Typically distributors don’t put a lot into the distribution of stories likeHeaven is for Real. Todd: The giant’s getting ready to wake up. There’s going to be a huge push to more than 2,000 plus theaters and you’re going to see all that media stuff come. From everything I’ve seen, Sony is not only surprised, but they are incredibly behind this movie because of the screenings and just how positive they’ve been. CJ: What was it like when Colton first started sharing his experience? Todd: People in the city don’t understand the small town dynamic. You can’t do anything in private in a small town of 2,000. Everyone knows everything. In fact, I can probably almost tell you who lives in every house in my town. So when Colton started sharing with some of his friends and other people…there’s no way to put a lid on the bottle. I mean, it either happened or it didn’t. He’s going to tell what he saw and experienced. This has happened now eleven years ago and the thing about our community, I think in the movie you have to compress time a little bit, but this happened slowly as people discovered it. CJ: How has it impacted those around him? Todd: Today, his friends at school are some of his best defenders, which I like that as a parent. When people criticize him, they’re like, “He’s been telling this story for years, way before the book came out, and nothing’s ever changed.” I think that’s some of the best credibility. Of course, we still have people around here that because of other faith or things they’ve been taught, they don’t want to accept what Colton has said, but the fact that Colton has been saying this for eleven years, no one can deny that. CJ: Sharing an experience all the way through childhood gives credence to the story and it’s hard to argue. Todd: Well, some people still try to, but I agree with you. You know, when he said, “I know what I saw.” That’s been Colton’s position and he’s been consistent on it. CJ: Some times the greatest messages come through the innocent perspective of children. What do you hope the audience will take away from the film? Todd: I think there are a few messages in this film that I think are outstanding. The first one is that faith is a struggle. Some people think you have to have everything figured out to believe in God or to trust God in the midst of difficult circumstances and that’s not true. Faith is, even when God doesn’t do exactly what you prayed for, you still believe and trust in him anyway. You’re gonna see that struggle…the honesty about faith in this movie. I think some times as Christians we try to pretend that we’ve got everything all fixed and that’s not being honest. I think we need to get people grace and understand. I know what its like to hurt. When my son talked to me about my daughter in heaven…We had a miscarriage, we didn’t know if it was a boy or a girl. We were carrying that broken piece (of miscarriage) around, as a lot of people do, and when you can admit your broken pieces that’s when you can start addressing and sharing them, and get some help with them. This movie is going to help people do just that, talk about what’s broken inside so hopefully God can fix those broken pieces. CJ: The film is scheduled to open after the blockbusters start to release. Do you think the film will be able to make as big of an impact? Todd: Audiences have connected with it so well. I was marveling at the reaction of it. And, I think the realness…is what really gets the audience into this film. CJ: What’s next for you and is your family ready for it? Todd: I learned that God’s got lots of surprises in store for me. So we just try to get through every day, (one) at a time. I feel as a person of faith that I can try to do the right thing and be obedient today and just leave the results up to God. When we come back home, where we spend most of our time, we say no (to speaking requests) way more than we say yes because we want our kids to still be in school. In fact, Colton is still in public school, not home schooling, and he cant’ miss so many days of school. So the fact that we spend more days at home rather than out on the road and we’re just the Burpos at home, I think that’s the best thing for us and Colton to keep grounded. CJ: Do you talk through issues with your kids about being in the public eye? Todd: The biggest thing that Colton’s concerned about now is what his friends are going to say after the movie comes out. So he deals with some real teenage questions that as mom and dad we have to sit down, pray about things and talk through things with him. We’ve said to him that worrying will never make tomorrow better, but it sure can make today a lot worse. We’ve just got to pray about those things, but we as a family have to have those discussions. CJ: I appreciate your time and openness in sharing about Heaven is for Real. Thanks for a great interview, CJ! I’m glad you liked it. Todd is a great down to earth kind of guy.